Where: This work was a part of the Bazaar at the Off the Press: Electronic Publishing in the Arts conference in Rotterdam. Published in the 1975, Mexican/Dutch artist Ulises Carrións wrote “The New Art of Making Books”. In the chapter “What a book is” he was thinking about books not restricted to its formal properties but as a sequence of spaces and moments, essentially liberating its definition from its physical representation as a paper codex. 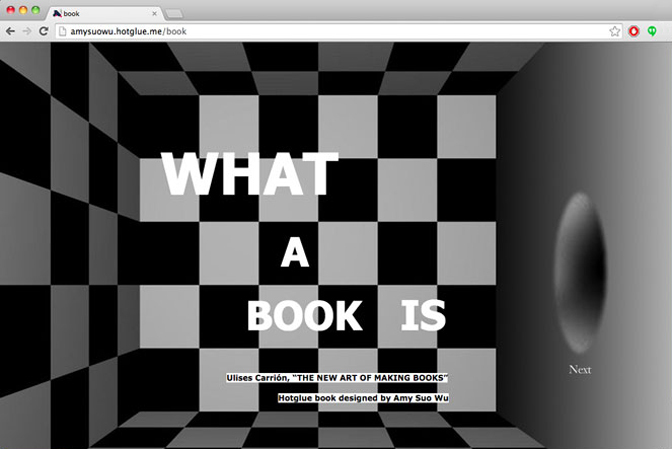 For the Off the Press: Electronic Publishing in the Arts conference in Rotterdam, I transposed the text “What a book is” into an e-book using hotglue, a visual tool for creating websites directly in the web-browser. Read the hotglue book HERE.